As the founder and CEO of The Network Group, Keran Wicks has been profiled many times within the media. Here’s a selection of her media profile for you to enjoy. News article about The Network Group’s ranking in 2013’s 50 Most Innovative Companies Awards. Full listing of the 50 Most Innovative Companies 2013. Keran talks about her rise to the top. Keran shares her experience as a woman in a male dominated business. News article detailing Keran’s victory over Warner Bros. Feature article from the Sunday Herald Sun. Keran talks about her business journey. Feature article on how Keran built The Network Group from scratch. Keran shares what makes The Network Group different. Keran delivers a key-note speech in her typical direct style. Keran gives some of her tips to success. Keran talks about the move to high-definition formats. A list detailing Keran’s unique journey. 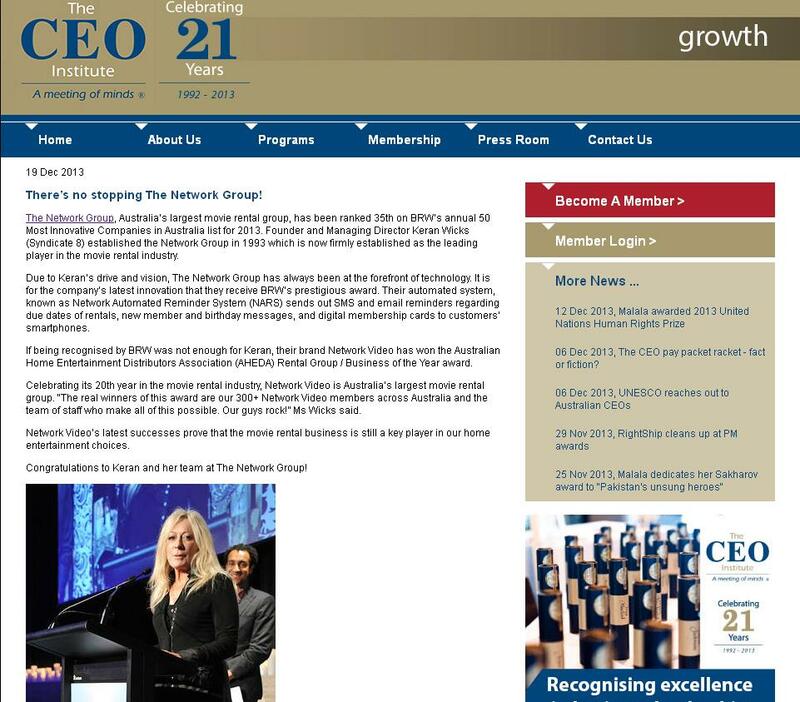 Article on Keran and the history of The Network Group. Keran talks about the arrival of Netflix. The Network Group is ranked in 2013’s 50 Most Innovative Companies Awards. Keran’s cover story shares the early history of The Network Group. Keran talks to The Australian to show how she rose from humble beginnings. Keran calls out The Network Group’s competitors to prove the viability of their business models. Feature article from The Sunday Age about Keran’s history. An interview with Keran about her history. Transcript of an ABC Radio National interview with Fran Kelly. Keran tells how she built The Network Group from the ground up. Women at work: living proof that success always follows a career you love. A quick look at how Keran’s passions influenced her career. Keran shares over 15 secrets to her success. Feature article about the evolution of the rental industry. Keran’s talks about some of her favourite things. AFR article about the rental landscape. Keran talks about the Cans4Films charity event. Keran speaks about the Cans4Films charity event. Keran is interviewed about the rental landscape. Keran talks about the history of The Network Group. Keran talks about the 7th annual Cans4Films charity event. As part of a Fox FM charity event, Keran does what she can to help. Keran talks about the impact of late fees on the rental industry.